We have produced the two street scenes that are charted in this leaflet for our many customers who prefer to work "finished" designs. 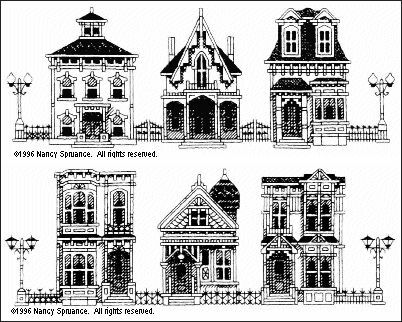 Each scene is a fixed arrangement of the six houses featured in our Victorian Miniatures chart pack. The fences, gate and lampposts in this chart are elements also found on the "add-on" chart contained in the Victorian Miniatures chart pack.